These special promotional TEE SHIRTS are produced from a painting by "The Painter of legends" ARMANDO DELGADO. 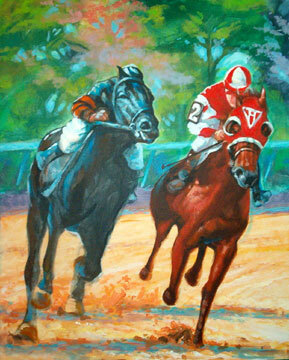 This work is entitled "The Race of the Century" it depicts the match race between the legendary SEABISCUIT and Triple crown winner, WAR ADMIRAL. "I wanted to capture the moment that Woolfe, Seabiscuit's jockey, and Seabiscuit glance at War Admiral saying this is my Day in History", DELGADO. Seabiscuit won handily, as he crossed the finish line by leading by 4 lenghts. 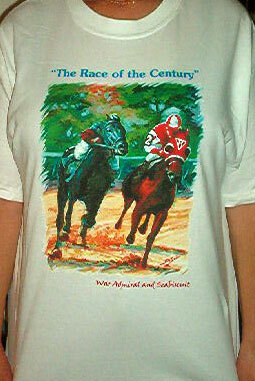 The front is a full color portrayal Delgado's "Race of the Century". 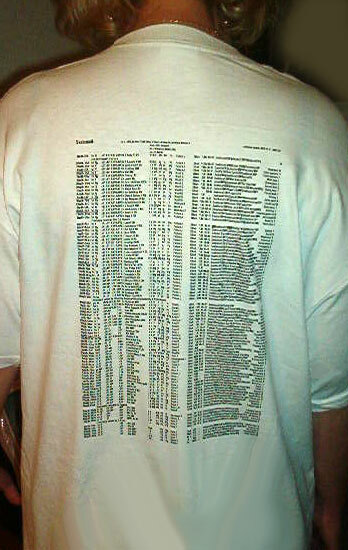 The back features a legible racing record of Seabiscuit's entire past performance and are printed on quality 6.1 heavy duty white tee shirts. In addition each shirt comes personally autographed with fabric pen by the artist! $24.00* *Price includes shipping to anywhere in the continental United States. Limited edition signed and numbered lithographs featuring the same art is available through this website. For additional information please click on the painting.